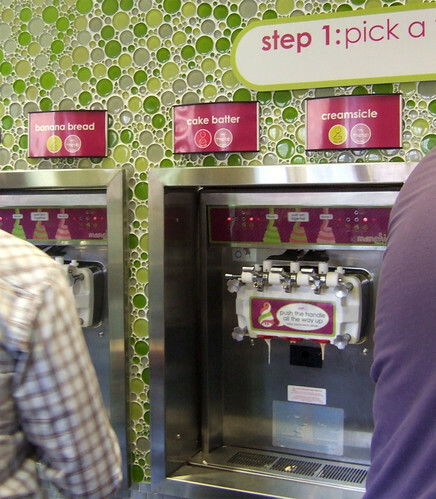 The place: Menchie's Frozen Yogurt Bar. The event: The first ever Bloghurt Fest. The challenge: To create the ultimate frozen treat. 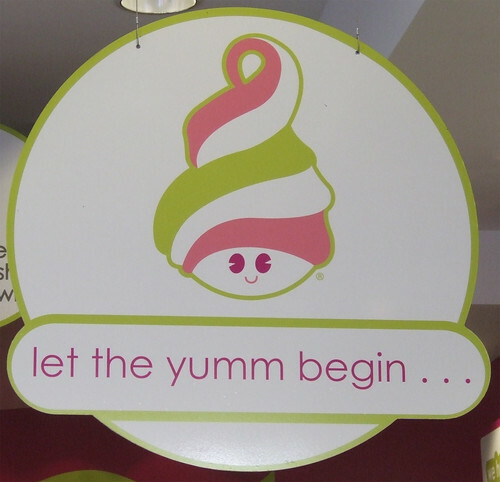 I was definitely ready to let the yumm begin when I stepped into the newly opened Menchie's Frozen Yogurt Bar in Toronto. Fifteen food bloggers and writers gathered together in the tiny but colourful and welcoming shop on Bloor West, ready to taste some frozen yogurt and have a little fun in creating a winning combo. The concept of Menchie's is simple enough: choose and serve your own frozen yogurt, pick your own toppings, put it on the scale to weigh, and pay. It's the next version of enjoying your frozen treats, where you get to interact and literally "play" with your food, rather than just stand on the other side of the glass. It's also advantageous to other frozen treat chains that charge you per topping. A tiny little sprinkle here could cost you at least a dollar or more. 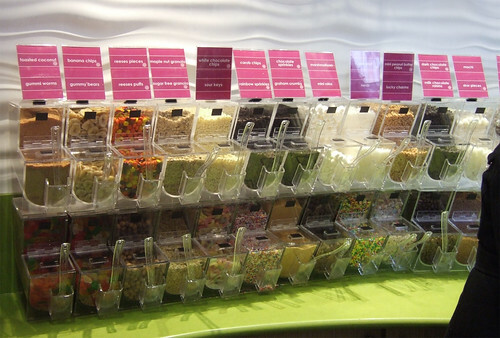 At Menchie's, everything is charged per weight, so you're literally paying for what you get. 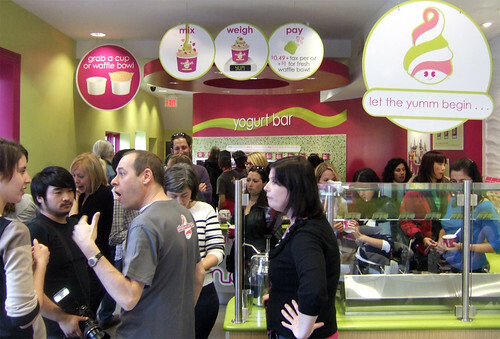 Menchie's rotates through 100 different flavours so every visit will offer something different. They have everything from "original tart" to cake batter, Irish mint to cookies and cream, a wide variety of fruit flavours, and more. 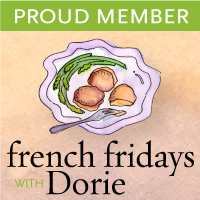 Aside from their regular frozen yogurt, which contains healthful live and active cultures, they also offer no sugar added, low-carb and dairy-free options. Best of all, Menchie's frozen yogurt is fat-free, GMO-free and kosher, and is only 112 calories per 100 gram serving (compared to 230 calories for the same size portion of vanilla ice cream). Next comes the toppings, with over 40 to choose from. This is where the fun really begins as you start building your own fro-yo creation. You've got nuts, fresh fruit, candy, chocolate, brownie and cheesecake pieces, sauces, and some oddities like mochi. Let your imagination and creativity go wild with different textures and flavours, or just pick all your favourite toppings! After spending a good amount of time tasting the various flavours of frozen yogurt on offer that day and playing around with various topping combinations, I was ready to create my masterpiece. 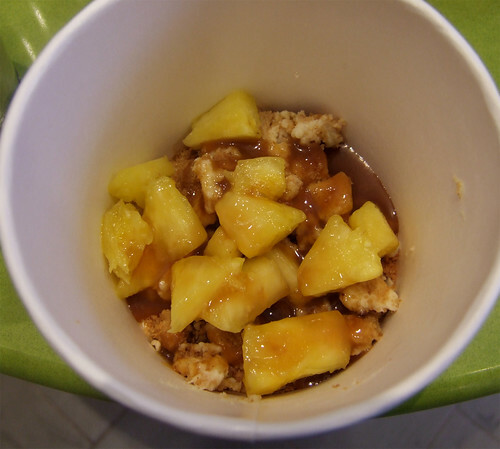 Tasting the yogurts and trying different toppings, I was inspired by pineapple tarte tatin and cheesecake, so why not create a pinepple tarte tatin cheesecake frozen yogurt? Repeat both layers and top with a sprinkle of graham crackers, roasted almonds, toasted coconut and coconut flakes, and a drizzle of caramel sauce. As you can see, I don't know my way around an ice cream machine. Despite my attempts to get the perfect swirl, I totally messed up and got more of a blob sitting in my cup. I tried to mask it the best I could with a final sprinkling of graham crackers, roasted almonds, toasted and regular coconut flakes and a drizzle of caramel sauce. No doubt I created the ugliest creation that day. I was up against heavy competition with fourteen other teams. Our creations were judged by Canadian Living Senior Food Specialist Adell Shneer and her son, Canadian Living Food Editor Annabelle Waugh, and esteemed pastry chef at Scaramouche, Joanne Yolles. In the end, my creation didn't win. But regardless of the results, I had a great time at Menchie's and felt like being a kid in a candy store again. The fact that Menchie's is so interactive and allows you to "play" with your food makes it fun and appealing to kids of all ages. Toronto food bloggers take over Menchie's Frozen Yogurt Bar. Not only did I had a great afternoon exploring the new Menchie's, but it was a great occasion to catch up with some fellow food bloggers and to new faces to new names. A huge thank you to Menchie's for hosting us, and to Mary Luz of Sizzling Communications for organizing such a fun and tasty day. 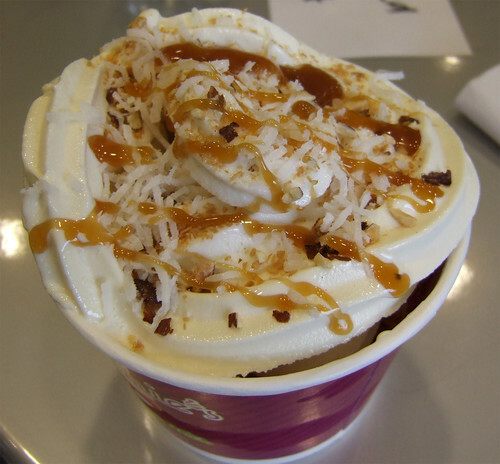 Be sure to check out Menchie's for yourself! ** Want to see Jamie Oliver and Bob Blumer at The Art of Cooking event in Toronto this Thursday, November 18? You can save $10 off the regular price of tickets. And if you register 5 or more people, you'll save an additional $10 ($20 total) off each ticket. Click here for the special promotional code to be applied to your ticket. Hurry, as VIP tickets are already sold out! The Food Junkie November 16, 2010 at 11:19 a.m.
Flotch November 16, 2010 at 11:22 a.m. I loved the Cake Batter and Pina Colada as well. Wish I had a taste of your combo. Was lovely to meet you. Anonymous December 16, 2011 at 7:52 p.m.
How much would your creation cost? Bonita December 20, 2011 at 5:54 p.m.
You're charged by weight, so it depends on how much yogurt and toppings you have in your cup.